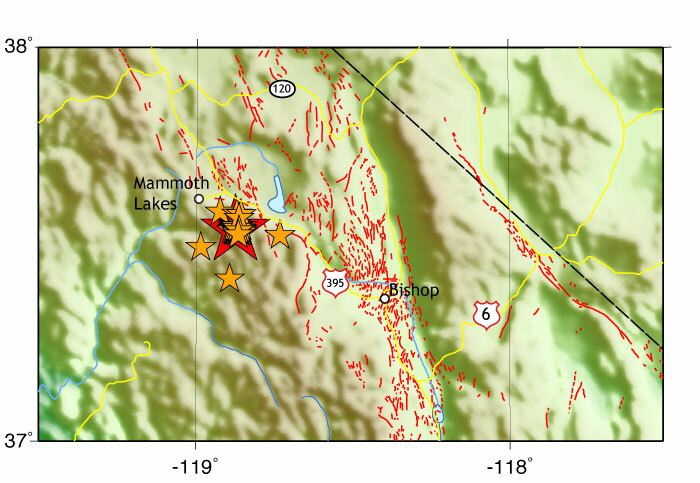 On Tuesday June 12 2007 (163) at 12:23 AM (PDT) we recorded an earthquake (preliminary Mw 4.6) located near Mammoth Lakes. Initial source parameters for this tremor are indicated below. The epicentral distance (i.e. the distance separating the epicenter and the closest station in the recording network) for Anza is 467 km (4.20 degrees). This map shows the mainshock as a red star. Faults are red lines. Associated aftershocks are orange stars. Anza network stations are yellow triangles. Gray lines are major rivers. This map shows the mainshock as a red star. Faults are red lines. Associated aftershocks are orange stars. US state highways are yellow lines. Blue lines are rivers. Main shock in red, aftershocks in orange. Aftershocks up-to-date as of 06/12/07 16:20 UTC (06/12/07 09:20 AM PDT). We operate a broadband station on Mt. Soledad. At 00:24 (PDT) station SOL recorded the P wave from this event. Here is a view of that event as picked by our analyst. A red P indicates a P wave arrival, a red S indicates an S wave arrival.